The average mouth is made to hold only 28 teeth. It can be painful when 32 teeth try to fit in a mouth that holds only 28 teeth. These four other teeth are your Third Molars, also known as "wisdom teeth. 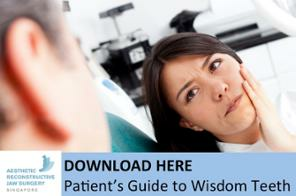 You can also download our free ebook on wisdom tooth surgery by clicking here. What Should I Know About Wisdom Tooth Extraction? Wisdom teeth are the last teeth to erupt within the mouth. When they align properly and gum tissue is healthy, wisdom teeth do not have to be removed. Unfortunately, this does not generally happen. A wisdom tooth extraction is necessary when it is prevented from properly erupting within the mouth. The tooth grow sideways, partially emerge from the gum and even remain trapped beneath the gum and bone. An impacted tooth can take many positions in the bone as it attempt to find a pathway that will allow them to erupt successfully. A poorly positioned impacted tooth can cause many problems. When it is partially erupted, the opening around the tooth allows bacteria to grow and will eventually cause an infection. The result: swelling, stiffness, pain and illness. The pressure from the erupting wisdom tooth may move other teeth and disrupt the orthodontic or natural alignment of teeth. The most serious problem occurs when tumors or cysts form around the impacted wisdom tooth, resulting in the destruction of the jawbone and healthy teeth. Removal of the offending impacted tooth or teeth usually resolves these problems. Early removal is recommended to avoid such future problems and to decrease the surgical risk involved with the procedure. With an oral examination and x-rays of the mouth, Dr. Chan can evaluate the position of the wisdom teeth and predict if there may be present or future problems. Studies have shown that early evaluation and treatment result in a superior outcome for the patient. Patients are generally first evaluated in the mid- teenage years by their dentist, orthodontist or by an oral and maxillofacial surgeon.